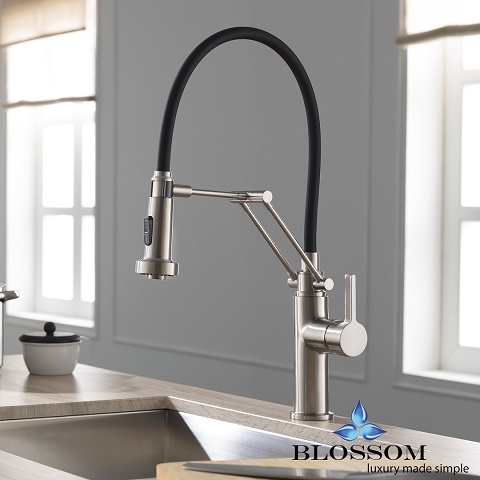 If you spend a lot of time in the kitchen – whether it’s cooking, cleaning, or both – chances are you also spend a lot of quality time with your kitchen faucet. I’ve talked before about how important it is to get a faucet that functions well with the way you use it, but today I want to make another, maybe slightly less practical suggestion: if you’re stuck spending a ton of time at your kitchen sink, find yourself a faucet that’s actually fun to use. 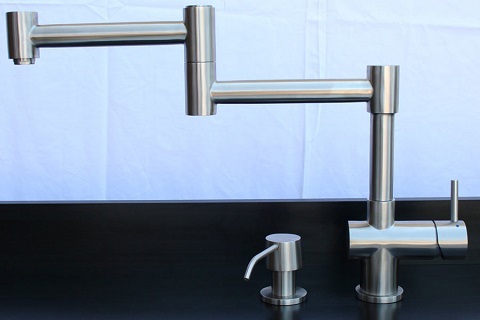 I know, it might sound counter-intuitive: a kitchen faucet that’s fun? But bear with me – these five futuristically styled, slightly playful faucets might be just what you need to inject some joy into your day-to-day. I’m not going to lie, I’m going to lead with a personal favorite. Fully articulated faucets are something of a rarity in the market; you’ll maybe find one or two here and there from companies that produce very modern faucets. But I absolutely love the sleek, sci-fi look of these faucets. They’re controlled by a single handle on the side, and are designed to bend, twist, and fold at every joint, meaning you can bend and shape it to spray in any part of your sink, or fold it entirely out of the way when you aren’t using it. 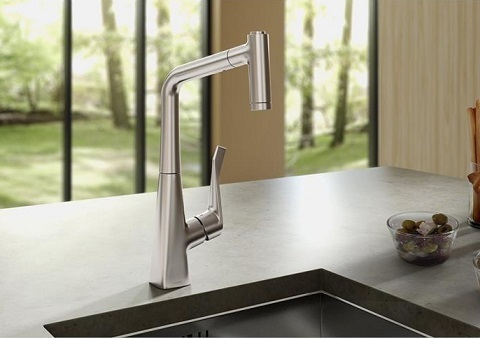 Lots of kitchen faucet manufacturers are hopping on the professional kitchen bandwagon, producing huge, commercial-grade faucets for use in home kitchens. And while these are actually pretty great for heavy kitchen work, they can be hard to match to anything but an all-stainless-steel aesthetic. Personally, I prefer faucets that do away with all the harsh metal coils and the extra-high-height and opt instead for something a little simpler – like an arm that lets you adjust the height of your faucet, or detach the nozzle for use as a free-moving sprayer. And if it’s kind of cute instead of a reminder of your stint as a restaurant dish washer, so much the better. I remember as a kid at Disneyland, I drank water out of a drinking fountain that had little lights built inside that made the water change color as it flowed. It was a fun little bit of whimsy, and while it’s admittedly maybe a little juvenile, it’s also a playful touch you can add to your own kitchen faucet. 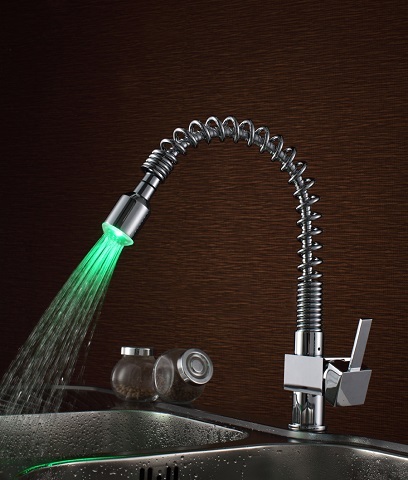 LED lights built into the nozzle of the faucet illuminate when the water starts flowing, harmlessly tinting the water, and even the water in your sink, depending on the strength of the light. Depending on the faucet, you can find LEDs in lots of different colors (or even color-changing, Disneyland-style ones), and if you need a grown-up excuse to get one, many models use a blue-purple-red lighting system to indicate the temperature of the water as an anti-scald measure. Then again, sometimes the most “fun” you can have in the kitchen is having a tool that makes your job just a little bit easier, whether it’s that perfectly seasoned cast iron pan, or a faucet you can use when your hands are gross without leaving a huge mess behind. Touch activated faucets have been making the rounds for a few years now, but they still have that rare, futuristic feel to them that makes them a little bit of a novelty. And, if you’re someone who spends a lot of time with your hands covered in bread dough or chicken juice, being able to set the temperature and flow of your water and turn it on and off with a light bump on the spigot can really be a novel experience. Using a kitchen faucet is almost always a chore, but just because you’re doing housework doesn’t mean you can’t have a little fun – and sometimes all you need is a pretty, playful faucet to brighten up your day. 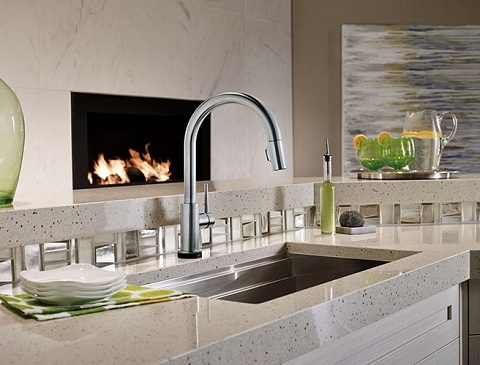 This entry was posted in Decorating Ideas and Tips, Kitchen, Kitchen Faucets and tagged futuristic kitchen faucets, Kitchen Faucets, led kitchen faucets, touch activated kitchen faucets, unique kitchen faucets.